It was loud and impressive but what was it called? She was severe that storm, but what was she called?. IT WAS IMPOSSIBLE to escape last weeks storms throughout Ireland. 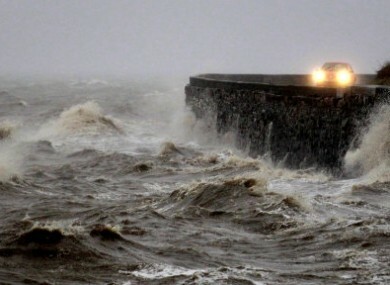 Not only because of the gale force winds crashing rain against your windows and the storm surges flooding the coasts. But also because, true to Irish form, it dominated everyday conversations and talk in the media. Both #Christine and the twitter account Storm Christine trended in Ireland as the storm passed over. But the storm wasn’t called Christine, or anything else for that matter. Simply because Met Éireann doesn’t name storms, and never has in the 78 years since it was formed. “If we named every depression we’d go through the alphabet five times over ever year”, says Met Éireann forecaster Pat Clark. “The only people who officially give names to storms in the Atlantic are the National Hurricane Center in Miami,” he explains. In fact, the Hurricane Centre of the US National Weather Service loves naming storms so much that they have the names ready six years in advance. The names are recycled every year and begin with the letters A to Z alternating between male and female names. A name is only removed form the list when it causes enough damage where it would be insensitive to repeat it. The reason for this is pretty clear explains Clark, with hurricanes that land in the US frequently far more destructive than Irish storms and as a result naming them can be a much easier way of warning people of their approach. Clark says that their counterparts in the UK don’t name storms either, something we can see from the repeated use #UKStorm hashtag last week, even after the fatal storm that hit England in last October when it gained popularity. “The only people in Europe that put names on their charts is the University of Berlin in Germany,” says Clark. These are not used universally in Europe though and storms are not centrally tracked by a European agency. “I remember seeing three lows on their chart recently and one of them was called Christine, so that’s probably where the name came from,” he adds. Not so, however, according to TV3 who say that the Storm Christine moniker came from their weatherman Deric Hartigan. Hartigan says he named the storm Christine because of its to proximity to Christmas and that seems to be how the name caught on. Coincidentally, western Australia was also hit by a Cyclone Christine on New Year’s Eve and is still cleaning up after the category three event. One of the new innovations anybody paying attention will have noticed over the course of Ireland’s three recent storms was Met Éireann’s new colour coded warning system. “This is a European wide development explains,” says Clark. “It’s proven to be very useful and many people have commented on how its worked well. There are allowances for different regions in Europe but it does come from greater alignment of national weather agencies”. The coloured alerts are used for far more than just storms with the public warned of rain and temperatures using the alerts. This being the reason for differences across the regions, a red warning for hot temperatures in Ireland is quite different to a red warning for hot temperatures in Spain for example. “This maybe is a little bit of a problem with it, we have the red warning but there’s nothing beyond it,” says Clark. After the last few weeks, let’s hope we don’t need it. Email “Why Storm Christine wasn't actually called Storm Christine”. Feedback on “Why Storm Christine wasn't actually called Storm Christine”.